Note as of 17 April 07 and for the next few days the information on this page is being updated with new information and analysis. 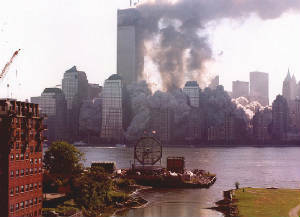 The demolition of the WTC towers was achieved using a four phase attack. 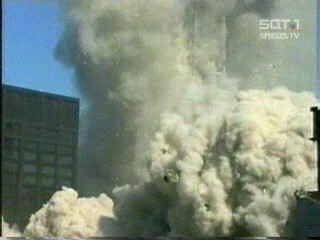 These attacks weakened the tower structure, initiated the collapse, progressed the collapse, and finally completed the collapse. 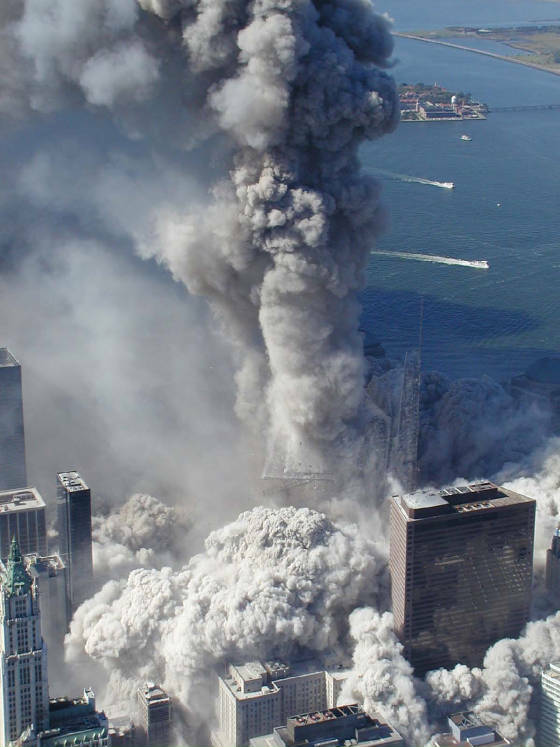 In this study I intend to show how the collapse of the towers was deliberately caused by the use of explosive and or incendiary devices placed at identified points within the structure. 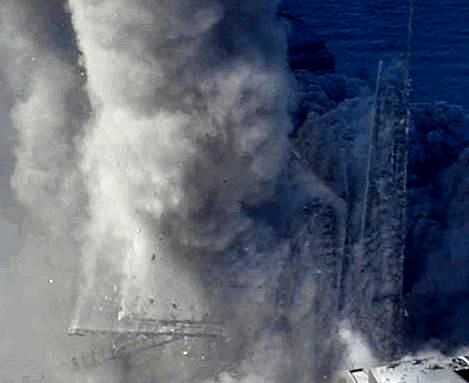 To show a viable explanation for the collapse it is necessary to identify the mechanisms and processes and by reference to the towers' structure and the visual evidence, show the cause and effect of all of the relevant phenomena which was observed. I intend to show cause and effect for the known phenomena and also to identify and show cause for some other, less well known phenomena of the collapse. 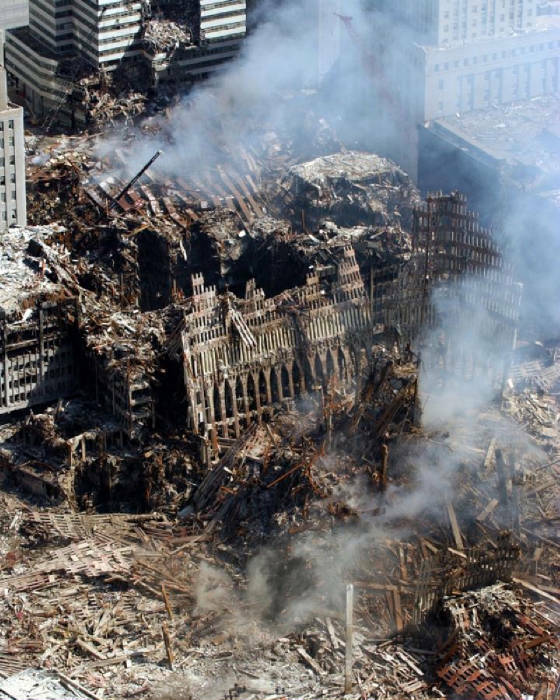 + Phase three progressed the collapse by disassociating the floor to perimeter column connections and two vertical lines of spandrel plates at each tower corner, and by continued attacks upon the corners as in phase 2. + Phase four completed the collapse by attacking the remaining central core structure at lower levels and disassociating the horizontal bracing. I will include in this report, representative photographs and screen captures of the various phenomena witnessed and in an appendix [to be added], I will include other examples. The visual evidence is freely available on the Internet and in some cases I have included a reference to the original source. There are others where I have not, as yet, given credit to the person responsible, in particular for those photographs with added graphics. I would like to publicly acknowledge their work now and will give further details if the persons so wish and e-mail some details. + Survival of the lower core structure until an advanced stage of the collapse. + Survival of the corners of the perimeter structure after the collapse front has passed. + Inward bowing of the perimeter walls. + Tilting movement of the upper section. + Early downward movement of the antennae. 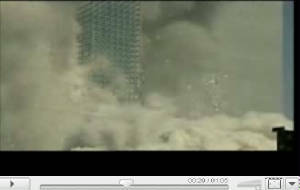 + Ejections of dust & debris simultaneously across whole floors. + Behaviour of the "spire"
The key to understanding the collapse of the Towers is in their design, most notably how the elements carried the load and interacted with each other. They were generally simple in their construction, in essence consisting of a core, a perimeter wall, a hat truss [the top], and a number of floors. The rectangular core consisted of 47 vertical columns arranged with horizontal and diagonal cross bracing. Its job was to carry the weight of itself, the enclosed elevators and core floors, as well as a proportion of the hat truss, and about half of the main floor load. The perimeter columns formed a square with horizontal bracing and chamfered corners, and carried themselves and about half the main floor load. The perimeter columns had a design safety factor such that they would have been capable of carrying the entire load themselves without the help of the core, although this would never be the case under normal circumstances. The floors carried their own weight and that placed upon them. They transferred this load to the perimeter structure, and the core structure to act vertically, although there would also be a small horizontal load under normal circumstances of loading. There are some important details to know in order to understand the collapse. 1/ The perimeter structure could carry all of the vertical mass above it at any point with ability to spare. So immediate collapse would not occur even in the event of a failure of all of the load carrying ability of the core. 2/ Similarly the corners alone of the perimeter walls could theoretically support the total vertical mass above them. The corners can be regarded as the most rigid and strongest part of a structure. Note how in demolished or fallen down buildings, a corner is often the last part standing. 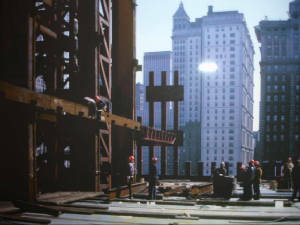 3/ The design of the towers was such that the floor trusses connected outwards from the faces of the rectangular core structure to connect only with the mid wall perimeter columns. The floor trusses carrying the floor sections in each corner were not connected directly from the core to the perimeter, but rather from the perimeter to a transfer truss and then to the core. The relevance of this is that if the core pulled downwards it would act effectively only through the floors to a proportion of the perimeter columns - those in the middle of each wall inside the lines of the core. The perimeter columns at and about the corners, those outside the line of the core, would not be connected via the floors directly to the core, but via the floors via the transfer truss to the core, and would therefore be less affected by a force caused by downward movement of the core structure. The result of a failure of the core such as this prior to collapse initiation would be to allow the mass of the core and floors above the failure to act downwards on the hat truss and the load would then be transferred to act vertically on the perimeter columns. The downward movement of the upper disassociated core structure would also allow a horizontal force to act on the mid wall perimeter columns through the floors to cause inward bowing of the mid wall perimeter columns. The still photographs taken by Aman Zafar during the collapse show that the core structure suffered a total and complete failure resulting in a complete disassociation of the core structure through a horizontal plane. [plane1] The photograph shows that part of the core remained upright as the collapse front progressed to ground level. This photograph shows that there was a total horizontal failure of the core structure at a level, some distance below the area of aircraft impact. An estimate of where this severance of the core took place would be about the 60th floor. This is more revealing than the still photograph in that we can see no downward movement of the remaining section. Collapse of this section was initiated at a later point in time. 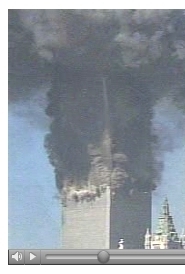 Note that the bowing identified by Nist was only on one side of each tower. It was not generalised across all of the tower. 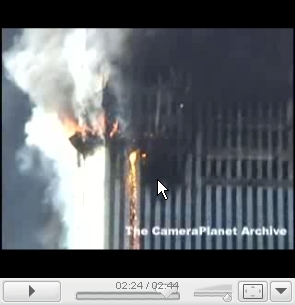 For the example of WTC1, Nist report bowing only on the South face, storeys 94 - 100. For WTC2 bowing only on the East face, storeys 77 - 83. 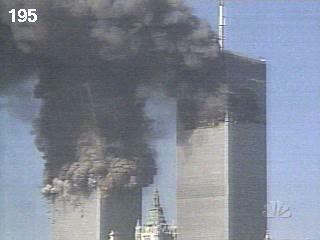 Note that for both Towers only the MID-WALL perimeter columns were bowed.The corners were not visibly bowed. If the bowing was being caused by a pure vertical movement of the upper core structure, that is with no tilt, the bowing would be present on all four sides. However if a 45 degree cut is made in the core columns, there will also be a horizontal component to the movement of the bottom of the upper core section and a consequent tilt in the upper core section. The floors will only transmit an inward pulling action through the floors to one wall, with a compressive action on the opposite floors and a twisting action on the floors on the adjacent sides. It was the reaction created by a, say, 45 degree cut through the core columns which began, both the tilting action of the upper sections, and the bowing of one perimeter wall in each Tower. Note the important point mentioned above that the design of the towers was such that the floor trusses connected outwards to connect directly only with the mid wall perimeter columns. The relevance of this is that the core pulling downwards would act effectively only through the floors to a proportion of the perimeter columns - those in the middle of each wall inside the lines of the core. The corners which were the strongest section of the perimeter structure were not placed directly under this load. 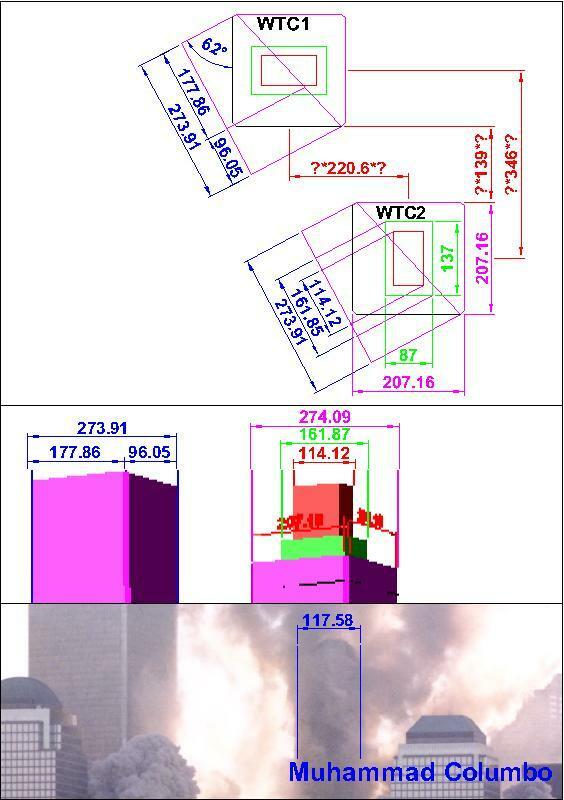 Further doubt is thrown on the Nist theory that the bowing was caused by sagging floors by examination of the photographs contained in their own report on WTC2, which shows floors sagging in a direction perpendicular to that which would be required to cause the bowing. Note also that while there is evidence in their report to show sagging did take place perpendicular to the direction required, there is no evidence presented that any sagging took place actually in the direction required. The animation shown to the left demonstrates graphically that all of the core structure and perimeter structure must bend to accomodate the tilt. Sagging floors cannot be regarded as being responsible for this level of pre collapse damage. 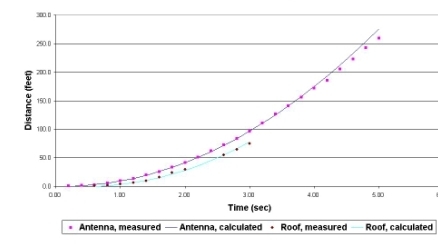 Examination of the video evidence shows that the antennae began to move downwards a fraction of a second before the roof line. This can only be achieved through a downward movement of the core to which it was directly connected. 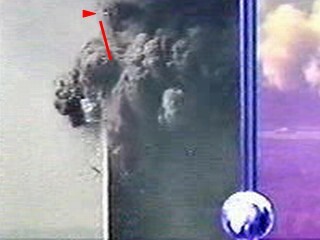 The early movement of the antennae in WTC1 when regarded in relation to the roof line shows that it was the movement of the upper core structure acting on the perimeter columns through the floors, which was driving the collapse in the early stages, and not vice versa. The object of Phase two was to achieve collapse initiation by an attack on eight initial points. These were located at each of the four corners of the perimeter structure on two storeys and caused crushing of the volume between. An ancillary attack was made to disassociate the hat truss. The result of these attacks was a radical reduction in the corners ability to carry load and this resulted in failures at the points of attack, the corners of the perimeter structure. The full weight of the tower above these attacks was then transferred to the midwall perimeter columns. These were already suffering under both vertical and horizontal forces and immediately suffered failure between the points of attack. The hat truss was disassociated allowing the upper core structure to drop downwards and thus pull inwards on the perimeter structure. Immediately prior to collapse initiation there is a distinct and obvious colour change to an area as highlighted in this photograph. There are several of these to be seen on other videos and photographs. These emanate from the same general position relative to the Tower corners and it is in these areas that the attacks occur. Three of these areas are very obvious in the next photograph. Two are evidenced by the short but intense flashes of light and the other is in the smoke emission highlighted. 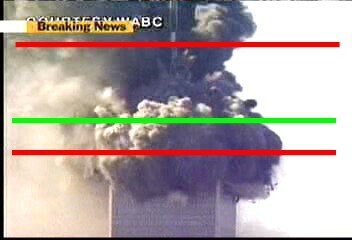 The pattern shown is evidenced throughout the collapse on many different videos with many of these flashes and emissions being seen at the same position relative to the corners of the perimeter structure, and at planes the same general distance apart. These phenomena occur in a consistent geometric pattern as they appear immediately before and during the collapse, and when regarded in the context of the tower construction the pattern is relevant. 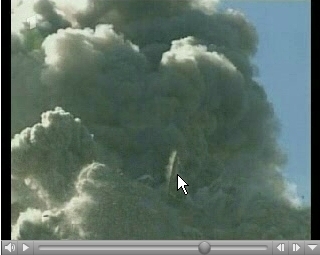 Professor Jones has highlighted and examined the molten metal which was seen issuing from the side of the towers immediately before collapse initiation. This was also at the same relative position to the corner. The corner column areas were by their nature one of the most rigid section of the towers and were to a large extent exempt from the loading applied by the core through the floors. Removing the ability of these columns leaves only the mid wall sections to carry all of the load above Plane 2 and all of the core load above Plane 1. The load would act both downwards and inwards through the floors on these remaining columns, and at that point, collapse of the area between these planes began. This was the disintegration of the upper section that commentators have noted. In actuality a partial disintegration. The planes were located as follows; Plane 3 at or about the storey where the bend in the upper section occurred and Plane 2 at or about the storey from where the molten metal was seen to be expelled. These represent the upper and lower bounds of the volume which was first crushed. The following graphics obtained from the excellent terrorize.dk site show this very clearly. These photographs in and of themselves destroy the arguments of Dr. Bazant and his fellow advocates of the "crush-down crush-up" theory of collapse. They demonstrate that the first storeys to undergo crushing were those between the two planes indicated. The lower collapse front did not accelerate at the same rate as the roof line. It is exactly at these planes that the first obvious failures are seen to occur. 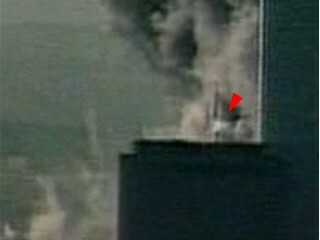 The corner of WTC2 is seen to bend at the point where the smoke emanates in the photograph above and at the lower plane indicated by the second photograph. Examination of video evidence shows that the following phenomenon coexist in time and space. 4/ local and definable damage. 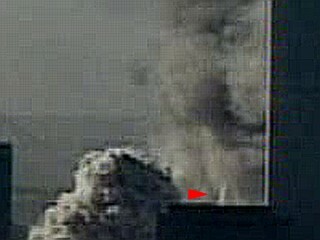 Note also the distinct white flash identified on previous photographs and still existing on the photograph above, now at a later stage of the collapse and now moving with the falling upper section. 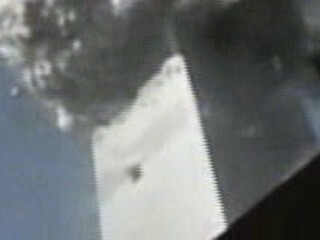 The upper section of WTC2 appears upon first examination to tilt as one piece about a fulcrum located at the aircraft impact level. Closer examination reveals that there is a distinct bend in the line of the corner columns and the top storeys of the upper section, those which are above the bend do tilt, but in the section below, more obscured by smoke, there is less, or even no, rotational movement in the line of columns. The upper section did not necessarily display the behaviour expected by some commentators and in particular it has been said that the conservation of angular momentum was not observed. Because the core failure occurred at a lower level than aircraft impact the core structure projecting below the impact level would give a "keel" action to the upper section as it fell. It would also give a different fulcrum position for the rotation, than has been previously examined. This may account for some questions which have been asked. This can be envisaged by imagining a Christmas tree being pulled downwards through a packaging funnel. The force only has to be generally downwards to have the trunk passing through the centre and it will tend to straighten or arrest any tilt of the tree. Note that the collapse front, plane 2 does not begin to move downwards immediately, there is a distinct time difference between the first movement of the upper section and the first movement of the collapse front. The collapse front also exhibits strange behaviour which has not been addressed by the official inquiries. The object of Phase three was to progress the collapse by severing the columns which made up the perimeter of the core structure and disassociating them from the remainder of the core structure. The upper core structure and floors being pulled down inside the lower structure would meet resistance from the floors below. To facilitate the collapse the 24 columns which made up the perimeter of the core and to which the floors were connected, were severed and broken free of the bracing which held them connected to each other and to the remainder of the core. Credit for the following new piece of information, as of April 07, must go to Muhammad Columbo. His perseverance and abilities have added another facet to this analysis and delivered a knockout blow to the official analysis of events. The photograph by Aman Zafar previously shown and commented upon, appears to show the lower core structure still upright after the floors and perimeter columns had collapsed to ground level. However, this is not the full story. Muhammad's analysis shows that the remaining core was too narrow to be the entire core, and was in fact, the inner 23 core columns. 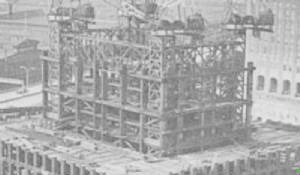 The 24 core columns which made up the outer perimeter of the core structure and to which the floors were connected are clearly absent from the photograph. Thus we can see that the outer core columns fell in the early stages of the collapse along with the floors and perimeter walls. For this to happen, the bracing which attaches these outer core columns, both to each other and to the inner core columns would have to be severed and each column broken into sections. 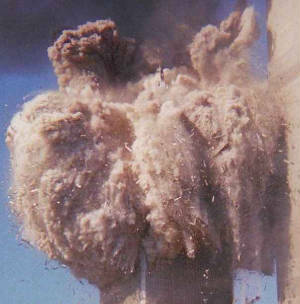 Almost immediately after collapse initiation there followed a rapid series of expulsions of dust and debris issuing simultaneously from horizontal lines across all walls of the tower simultaneously. These progressed rapidly downwards and in some instances their progression was faster than that of objects falling outside the tower. The photograph above shows the first early stages of these expulsions on the same level as the highlighted flash. It has been argued that the expulsions in the early stages of collapse were caused by air pressure between pancaking floors but the tilting of the upper section would not allow the symmetry in the collision between floors required for the symmetry of the expulsions. Simultaneous emissions of trapped air across whole floors could only be caused by straight down collapse of one floor onto another and thus the tilting of the upper section rules this out as a cause for the behaviour of the expulsions. In other words the tilting rules out pancacking floors as an explanation for the ejections of dust and debris. Further refutation of theories which explain these expulsions as being part of a gravity only collapse is found by examination and identification of the storeys from which these expulsions are emitted. The following analysis shows that the expulsions do not occur on every storey but rather from storeys about four or five apart with no such comparable expulsions from storeys between. These first two photographs show the progression of the expulsions down from the collapse front. 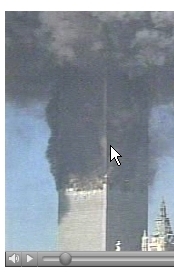 These photographs were taken from the 911research site where the timing is given as 30 frames per second, and the photographs are numbered based on this timing. This gives a time difference of just under a quarter of a second. The difference to note in these photographs is that the expulsions in 195 are from about four storeys above those in 203. No expulsions are evident from the intervening floors. 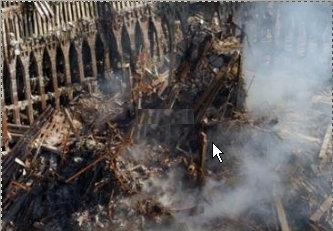 Use the spire as a reference to see this effect more clearly or visit the 911research site, to see a full array of photographs. Note in photograph 243 that the corner section is not affected by the expulsions. They remain visible for a period as the dust cloud expands around them from other sources. This is common to all of the videos witnessed. 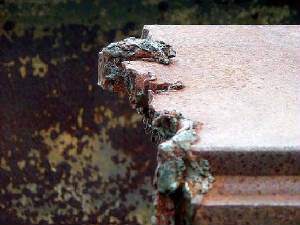 The corners of the perimeter sections are not involved with the expulsions of dust in the early stages of collapse. A gravity driven collapse involving each storey in turn would have similar phenomenon being visible from each storey in turn. This was not observed and the phenomenon of the expulsions must therefore have as their cause, something other than a gravity driven collapse involving each storey in turn. Note also that the corner columns below plane 2, unlike the mid wall columns, do not collapse with the collapse front, but remain standing for a period of time, before then falling inwards. 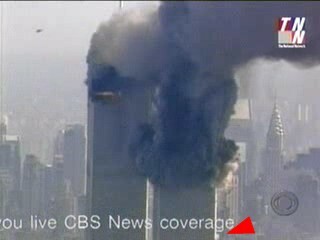 These corners do fail at a slightly later stage and in at least some cases fall inwards after collapse has progressed below their level again showing the spacing and pattern of the planes under attack. It would not be necessary to continue these attacks all the way to ground level. The survival of these corner sections of the perimeter structure, show the order of collapse. To allow this two vertical lines of spandrel plates - the perimeter horizontal bracing - have to be disassociated at each corner. The mid wall columns disassociated from the floors, can fall outwards, while the corners remain upright. The later failure of these corner sections, and particularly the arcs which they describe as the fall, showing that further failures took place above ground level, are evidence of further attacks on the corners as in Phase two, at other planes below the impact levels. This is again reinforced by flashes of light and smoke emissions. These two photographs, again from terrorize.dk, graphically show the eventual failure of one such corner section. The failure is again seated at the point in time and place of the flash of light. As mentioned previously, in the area of the maintenance floors there was a more robust structure to satisfy local load considerations. These required special attention from the demolition. The following photographs showing large expulsions from those areas before the collapse front approaches their position shows the independence of these effects from the collapse front. In short the progress of the collapse below the aircraft impact level was facilitated by detaching the floor to column connections below this level, and by attacking the spandrel plates connecting the corner perimeter columns to the mid wall perimeter columns. This is accompanied both in time and place by the expulsions of dust/debris. The mid wall perimeter columns below the aircraft impact, fall outwards as the upper section is pulled down inside them by the falling core. The object of Phase Four was to complete the collapse by attacking the remaining core structure both horizontally at lower levels and vertically by disassociating the horizontal bracing. The disassociation of the horizontal bracing and the division of the core columns into short lengths allows the core structure to progressively break apart and collapse over a time period of a few seconds. 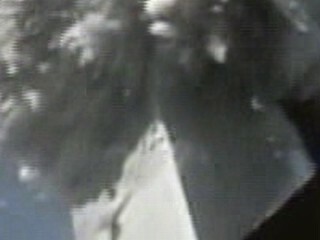 The first six or so seconds of the above video shows many short duration, flashes of light, intense enough to be seen through the clouds of dust and smoke. Note that I have tried but am unable to take screen captures from this video to illustrate these flashes. If anyone can supply these I would be very grateful. This second photograph by Aman Zafar shows the collapse of the remaining section of the core. Taken only a few seconds later the top of the core structure is only just visible. Most notable and revealing aspect of the survival of the core until this late stage of the collapse lies in how they behaved when they did fall. The columns fell independently of each other showing that all of the horizontal bracing which previously connected them had been severed. Look at the arc described by the falling core sections in this photograph. The centre of rotation is not at ground level which shows that failures have taken place at a level which is above ground level. Note also that the core columns are falling independently of each other and this has been made possible by the disassociation of the horizontal bracing. This is not a mechanism which can be plausibly explained by a gravity only collapse, since this would require that, as a result of predominately vertical forces during the collapse of the floors and perimeter structure, all of the horizontal bracing was completely severed, yet the columns remained upright. Then the columns themselves in turn failed into straight sections showing no other sign of attack. The ends of these relatively straight column sections have a luminous appearance and they emit and trail smoke as they fall. This is a sign of thermal activity and this appearance would not be caused by a purely mechanical failure. No gravity only collapse could cause such precise disassociation of the core structure into constituent pieces, nor could it be responsible for the smoke and flashes of light. Note the highly unusual appearance of the end of this column. This is not what we would expect from a column which had been fractured by a mechanical force alone. The material adhering to the columns would have been fully investigated and identified by a competent investigation. In such an investigation the column should have been identified as to its original position in the tower structure and examined on a microscopic level to ascertain the extent of any Heat Affected Zone and this would tell us, the nature and extent of any thermal effects which may have accounted for this appearance. This analysis shows the order of the collapse from initiation to completion of the collapse. 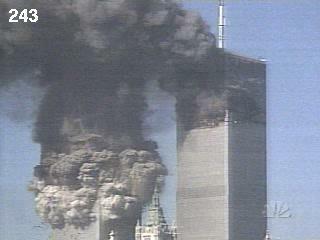 It has identified the outline procedure which was used to cause the towers to fall. A consciencious investigation would have revealed all of these pieces of evidence and explained what each piece meant in terms of the initiation and progression of the collapse. 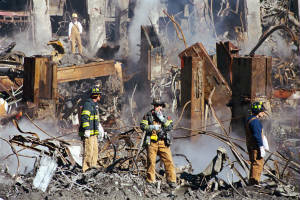 The 911 Commission, FEMA, and NIST examined the collapse and were charged with explaining the mechanisms of the collapse. Not only did they fail to adequately do so, they failed even to identify and incorporate the various pieces of evidence detailed in this analysis. This page is under construction and further details will be added as work on the final version progresses. These details will include the evidence upon which my deductions have been made.